How can I tell if a hydrogen is a wedge or a dash in a chair skeleton? Here at StudyOrgo, we frequently get questions about topics in organic chemistry that are usually quickly covered, poorly described or expected that you know from previous courses. These concepts are really important to understanding the more complex topics to come. In this article, we will cover the concepts of stereochemistry descriptions using bold and wedged bonds. This is just a preview of the detailed topics and materials available with your membership to StudyOrgo.com. Sign up today! The first thing we have to do is determine is how you want to orient you molecule. Let’s take (1R, 2R) 1,2-dimethylcyclohexane for example. If we orient the molecule to have the methyl groups on the right side, we see that we have two stereocenters available. But the current drawing doesn’t indicate the stereochemistry yet. That’s what the bold and hashed bonds will indicate. Next, we have to visualize the cyclohexane ring in the chair conformation. Remember, that the skeleton image shown above is more conveniently drawn, but loses the 3rd dimension information, so you have to put it back in the chair to determine which should be bolded and which should be wedge. Next, we have to confirm that that the stereochemistry is correct. To do this, you need to practice selecting most important substituents and rotating to assign stereochemistry. Follow along with the examples below, using the blue and pink carbons shown. At this point, you should be able to see how the hashed and bolded bonds are now appropriately drawn. The pink stereocenter will be bolded, suggesting it is above the plane of the ring and the blue stereocenter will be hashed, suggesting it is below the plane. Drawing the Newman Projection down the red bond shows that the methyl groups are “anti” to each other, making this a stable conformation. Studying ahead for Organic Chemistry this Fall semester is a good way for reaching and maintaining a great grade in this class. Most students find the pace of this class very challenging compared to other courses. This is because while there is a lot of information to learn, it also builds on previous concepts from general chemistry, a course most students want to forget! But don’t worry! StudyOrgo has you covered. Our Editors have spent years tutoring and teaching Organic Chemistry to students and we have seen all of the pitfalls common to the first few weeks of the semester. Our online platform allows members to learn organic chemistry concepts and mechanisms quickly and the material presented in an easy-to-follow format. Follow along with us and sign up with StudyOrgo today to help prepare you for all of your Organic Chemistry questions. One of the concepts you will need to have mastered before you begin the class is Intermolecular Forces. These intermolecular forces are the result of electronegativity differences between the atoms that result in the amount of net electron density around each atomic bond. In order to talk about these forces, a few definitions are necessary. Let’s take acetic acid as an example. It has one C-O bond and one C=O bond. The result of the electronegativity difference is that the amount of electron density on carbon is reduced significantly as a result of the C-O bonds. This leads to an overall reduction in electron density on carbon, a delta positive charge (blue color of orbital), and a gain of electron density on the oxygens, a delta negative charge (red color of orbital). There is no real “charge” but the probability of electron density is higher around the oxygens, making them appear to have extra electrons, like an anion would have. The “flow” of this electron density results in the formation of a dipole, which makes up a polar covalent bond. Polar covalent bonds will interact with each other (red dipoles) in the “like-dissolves-like” concept you learned in organic chemistry. 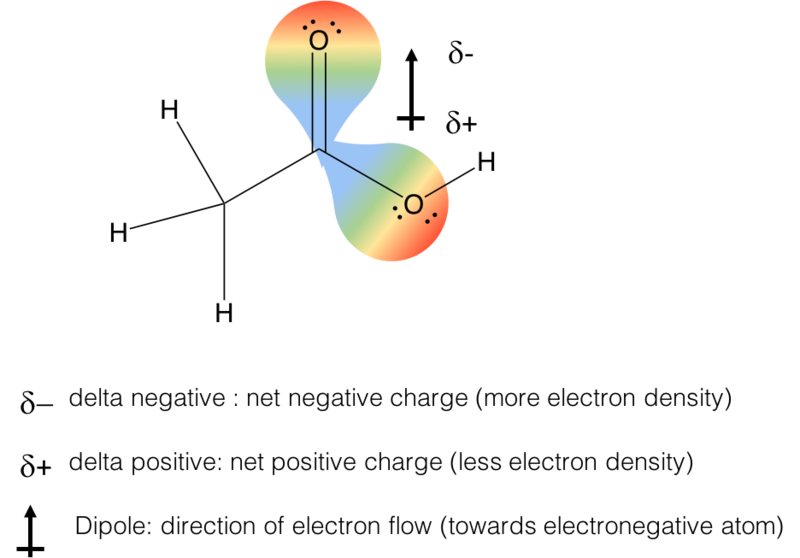 The dipoles will interact with each other, the delta positive of one molecule will interact with the delta-negative of another molecule to create a dipole interation. 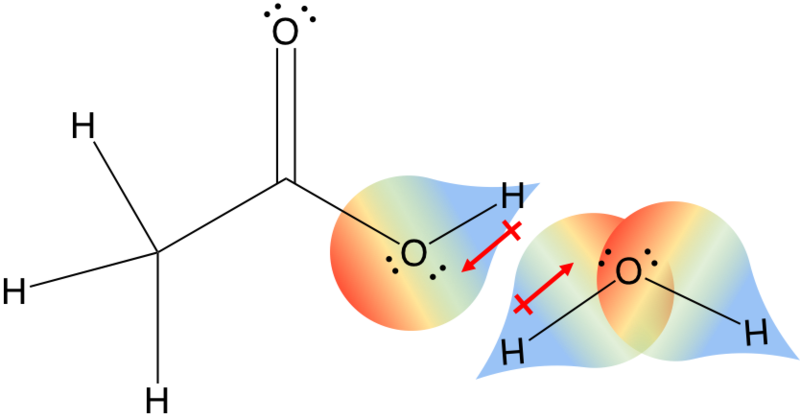 When there is a hydrogen atom bonded to an element with lone pairs of electrons, it is possible for the delta positive hydrogen (the hydrogen bond donor) of one molecule to interact with the lone pair of electrons on another molecule (the hydrogen bond acceptor). This can happen for any molecules in solution, therefore protic solvents (such as ethanol) can form hydrogen bonds with itself while aprotic solvents (such as methylether) cannot. The result is easily seen in boiling point, which is 78C for ethanol but -23C for methylether. 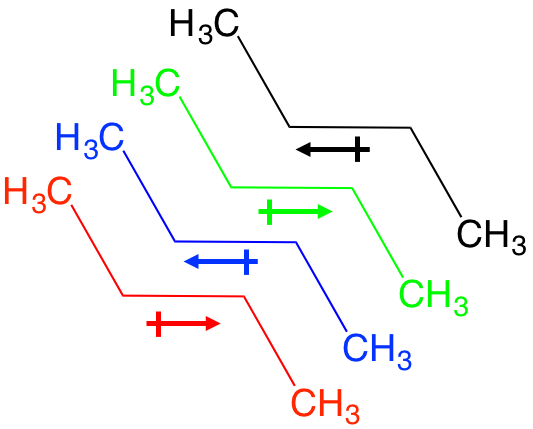 One rule is that hydrogen bonds must be planar to the hydrogen donor an acceptor, so there are some constraints on structure. This is what gives DNA its helical shape, which you will encounter in another course. These obscure forces are best described as very weak, very temporary dipole moments between non-polar covalent bonds. Let’s look at butane, an alkane. There is a temporary flow of electrons between each C-C bond and for an instant, a net dipole between each C-C bond. This allows for temporary interaction with a neighbor molecule that has the opposite temporary dipole, and so on. The effect is thousands of weak dipole interactions that add up to a large force, and the basis for what we refer to as hydrophobic interactions. This semester you will start Organic Chemistry and you have likely heard a lot of rumors about the class; statements from upperclassmen like “it’s difficult”, “this class is impossible” or “the professor is horrible!” We here at StudyOrgo have helped countless students overcome the difficulties of this class and can help you before you even enter the class. We have over 20 years of collective experience tutoring and teaching Organic Chemistry and have developed a few helpful tips that have saved students from the seemingly crushing pressure of Orgo 1. StudyOrgo has over 180 reaction mechanisms typically covered in Organic chemistry and explained in an intuitive and clear manner available in an online format. We also offer the Quiz Mode to allow you to customize reactions and test your memory of important parts of all of our reactions. We offer simplified and illustrated descriptions of complex concept topics that you will encounter in your first few weeks in Orgo 1. We also have developed a mobile app for iOS and Android smartphones that allows you to study organic chemistry on the go! Sign up with StudyOrgo today to take full advantage of our system! Here’s what you can expect in the first few weeks of Organic Chemistry 1. 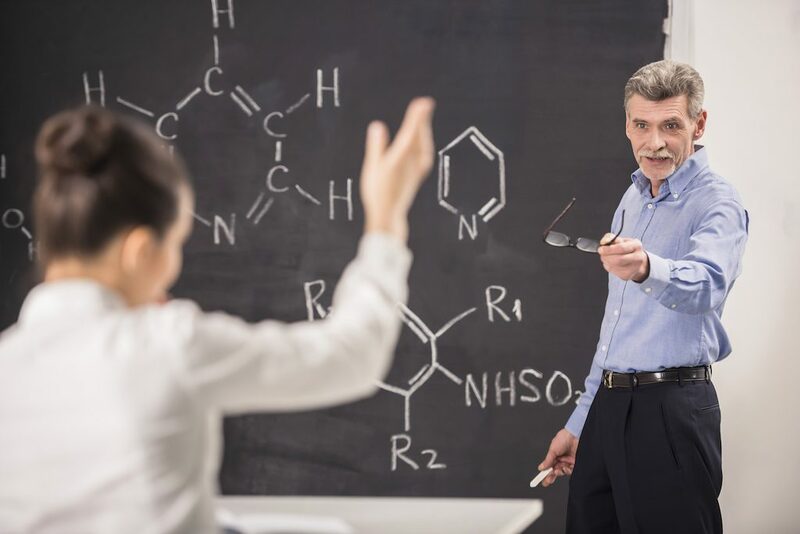 Most professors will spend the first class reintroducing general chemistry topics, but he or she will completely assume you received an A+ in general chemistry and have a full grasp of all these concepts! 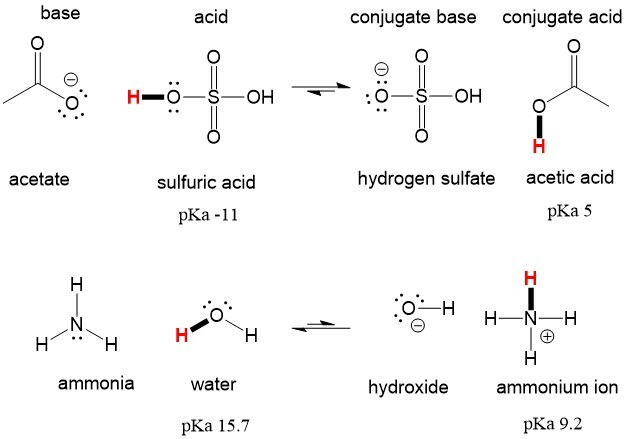 Refresh your memory of atomic structure, valence electrons, acids/bases and pH/pKa concepts. These will be used right away in Orgo 1. If you aren’t sure, ASK FOR HELP!! Tip #1 – Look at a syllabus – Remember, your syllabus is an official contract between you and the professor. Professors are required to disclose what you are required to learn and what grading rubric will be used. Professors can usually remove requirements (to the delight of the students!) but cannot easily add them. Use this to your advantage! Highlight the contents or reactions of the book that will be required and use this to focus your attention when studying this semester. Professors will almost always begin quizzing the second week, the midterm is only 7 weeks away. Prepare for them early!! Tip #2 – Schedule you’re studying! – Now that you know where the book is and a rough idea of what you are responsible for learning from the syllabus, take a calendar and divide the time you have to each test by the number of chapters. Schedule 2-3 hours a week to study and DON’T SKIP OR RESCHEDULE. Use your Smartphone calendar to send you alerts and reminders for your studying appointment. The class is about to go supersonic speed! Stay ahead of the pace of the class to avoid falling behind!!! Tip #3 – Read ahead – The first week of Orgo2, read two chapters to get yourself ahead of the class. Don’t try to understand everything, just read the text and try to understand the big ideas. This will completely change the way you pay attention in class and allow you to spend more attention and ask questions about the details in class instead of scrambling to write down notes and drawings. Tip #4 – Attempt ALL homework problems – When tutoring students, they are often intimidated when we ask them to try sample problems. But after a few examples, every student does them better and better with each new problem. Some students have even made comments such as ‘why didn’t I do this sooner?’ We were at StudyOrgo agree! It takes a lot of time, but practicing the problems will make it easier for the quizzes and tests. Most importantly, RELAX!! With a little time management and help from StudyOrgo, you will have no trouble getting an “A” in Organic Chemistry this year! Going into the spring semester, you might feel like you know what Orgo 2 will be like. However, the second semester of organic chemistry has a very fast pace, anywhere between 50-100 reactions will be presented. You’ll be responsible for all of them! Sign up with StudyOrgo today to help you get all of your reactions mechanisms and descriptions instantly! Read ahead – The first week of Orgo2, read two chapters to get yourself ahead of the class. Don’t try to understand everything, just read the text and try to understand the big ideas. This will completely change the way you pay attention in class and allow you to spend more attention and ask questions about the details in class instead of scrambling to write down notes and drawings. Attempt ALL homework problems – When tutoring students, they are often intimidated when we ask them to try sample problems. But after a few examples, every student does them better and better with each new problem. Some students have even made comments such as ‘why didn’t I do this sooner?’ We were at StudyOrgo agree! It takes a lot of time, but practicing the problems will make it easier for the quizzes and tests. Look at a syllabus – Remember, your syllabus is an official contract between you and the professor. Professors are required to disclose what you are required to learn and what grading rubric will be used. Professors can usually remove requirements (to the delight of the students!) but cannot easily add them. Use this to your advantage! Highlight the contents or reactions of the book that will be required and use this to focus your attention when studying this semester. Schedule your studying! – Now that you know where the book is and a rough idea of what you are responsible for learning from the syllabus, take a calendar and divide the time you have to each test by the number of chapters. Schedule 2-3 hours a week to study and DON’T SKIP OR RESCHEDULE. Use your Smartphone calendar to send you alerts and reminders for your studying appointment. Sign up with StudyOrgo – The Editors at StudyOrgo have compiled detailed mechanisms and description of over 175 reactions in the most crystal-clear and “get-to-the-point” format possible. Many of our reaction have multiple examples, so you can learn and then quiz yourself in our website! For the student on-the-go, we have also developed a mobile app (iOS and Android) provides all the functionality of the website! All of these benefits are included in your StudyOrgo membership! With good time management and help from StudyOrgo, you can earn a top grade in your Orgo 2 class this semester!